Hello, Cheesy Bacon Oven Chips. Where have you been all of my life? 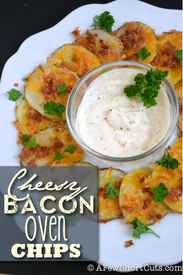 The perfect mix of bacon, cheese, and potatoes! Plus they can be made as an appetizer too! They are unbelievably perfect for watching football. The kids love that they can eat them with their fingers, and I love that they aren’t fried! Line a large baking sheet with aluminum foil and lightly coat with cooking spray. Lay out potato slices about ½ inch from each other (not overlapping) and lightly coat with additional cooking spray. Sprinkle each slice with shredded cheese and crumbled bacon. Bake 8-10 minutes, or until cheese is melted and bubbly. Remove from oven and immediately sprinkle with salt. Allow chips to cool for a few minutes before serving.